I’ve kept my screens obscured beneath matte screen protectors for years. Firstly, I hate glare. Secondly, I had a major crush on screen-devouring Adonit Jot styluses. No longer. A friend at Kleverdog Coworking chose a Pencil by FiftyThree. At first I sneered (to myself because David is a good friend) as the Pencil is not a precision stylus, is angle-sensitive instead of pressure-sensitive, and can’t be used with most screen protectors. But as I replaced screen protector after screen protector worn through by Jot products, I became a bit envious. Then my precision, pressure-sensitive Jot Touch failed under warranty. I replaced it, and the replacement failed under warranty — in exactly the same way. I put the Jot Touch on the shelf rather than go through yet another return — replace — fail cycle. I told myself I’d get it working somehow. But I kept using my Jot Mini and Jot Pro, and replacing screen protectors every six months. When my dear old iPad 3 failed two weeks ago, I was faced not only with replacing it but also getting a bunch of new accessories that would fit the sleeker iPad Air 2 I was buying. 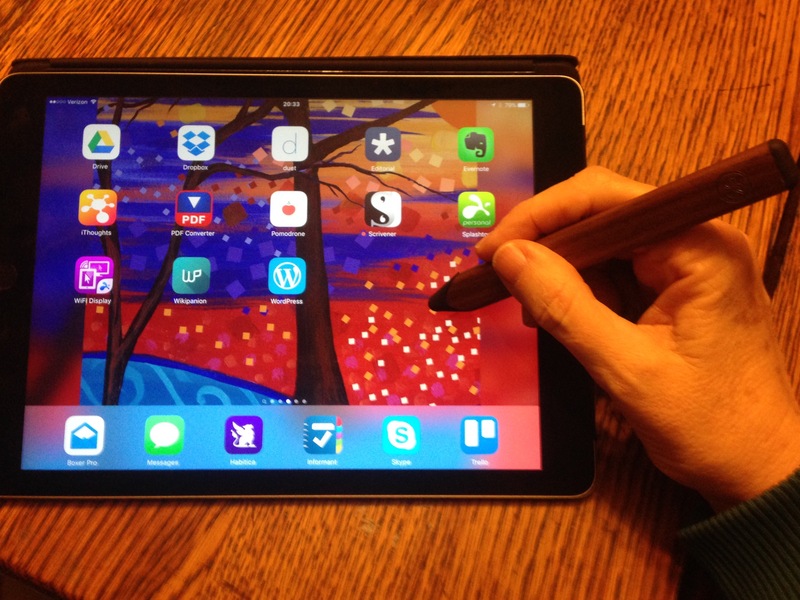 I knew that the Jot Touch was notorious for not working well with the iPad Air 2 — if I could get it working at all. Apple also claims that the Air 2 has an anti-reflective coating, reducing evil glare. So I decided to get a Pencil by FiftyThree — and let my iPad Air 2 go commando. I had forgotten how silky-smooth a naked iOS screen is. I did not remember how crisp the Retina display is when not buried beneath a matte overlay. The anti-reflective coating does some good — the glare is not as painful as it was with the old iPad 3. Every moment of handwriting and drawing with my 53 Pencil is a joy. I’m even using the iOS Scrivener beta with the on-screen keyboard. I briefly considered letting my iPhone 5c go commando as well — but I decided that was going too far. I did replace its nasty, scarred matte screen protector with a new, glossy oleophobic one, though. Now my iPhone feels almost as nice as my new iPad.